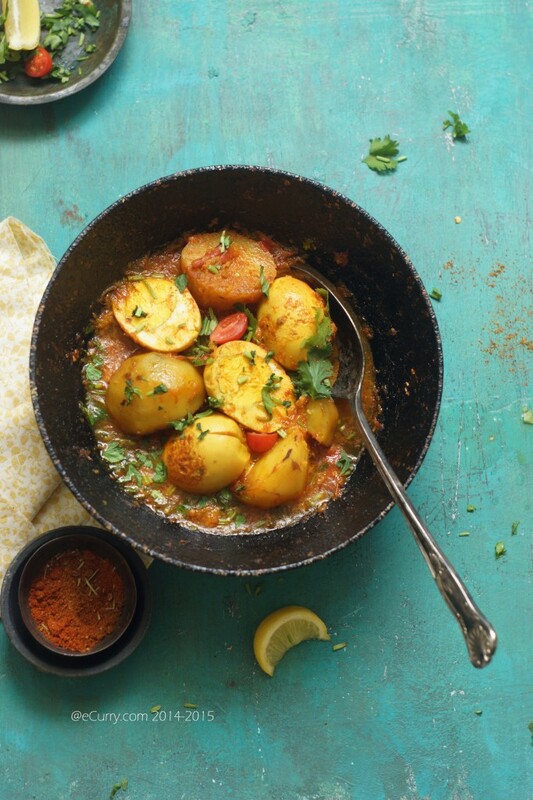 A Dimer Jhol will always have potatoes in it, just like the Mangshor Halka Jhol or Robibar er Murgir Jhol. The Jhol is perfect during summer months. Light and fragrant without the overwhelming trails of spices. Do have some hot steaming rice and a fresh squeeze of lemon juice to accompany it. If all the innumerable kinds and variations of curries are not baffling enough, Bengal has its own distinctions of curries. Jhaal, Jhol and Dalna. Jhaal is usually the more spicy version often with thicker sauce. 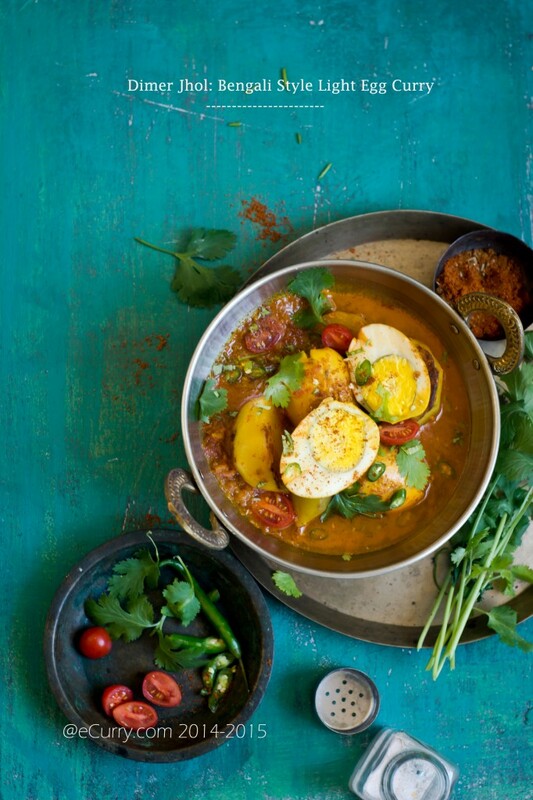 Jhol is a mildly spiced curry with the consistency of a thin watery soup. A Dalna on the other hand is hard to describe. It is somewhat in between a Jhal and a Jhol; not too spicy, yet has more spices than a light Jhol and maybe more ingredients. We Bengalis make Jhol (and Jhal) with almost anything. Vegetables, fish, egg, meat or a combination of vegetables and a protein. If you think you need a long row of jars filled with spices to cook an Indian curry, you need to think again and maybe give this is a try. You will need no spices. Okay maybe only turmeric and chili powder, but you can do without them. Only your curry will look sort of pale. But yes, you can totally cook this without any spices. And and the recipe does not use any onion or garlic. 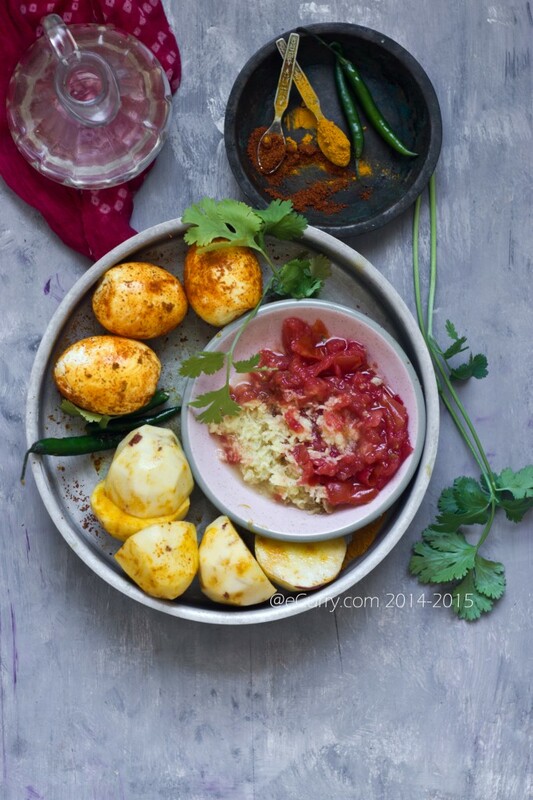 smear the eggs and potatoes with salt and turmeric. I do not make Dimer Jhol or any kind of egg curry as often enough as I would like to. I am the only one in the family who grew up with it. A Bengali Dimer Jhol or Dimer Dalna happens on the days when there is no fish or meat with the meal. Or when you have an almost empty refrigerator and you are craving comfort food. However this is not how it always used to be in Bengal. 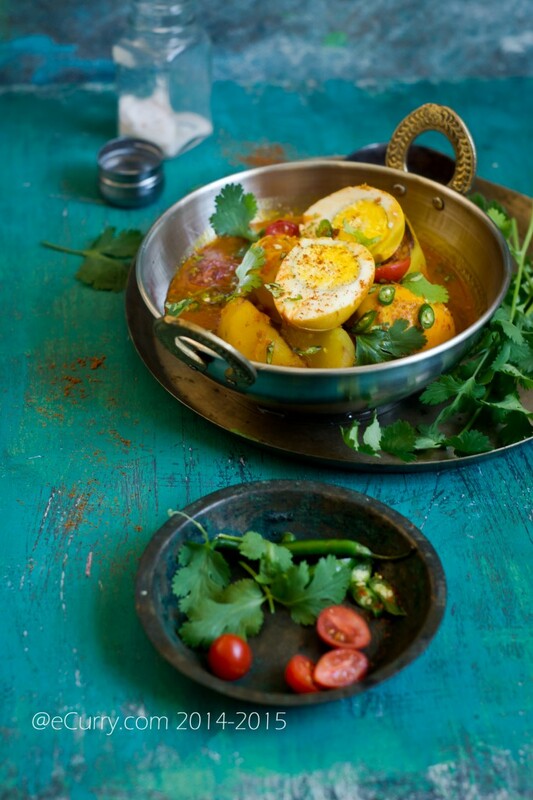 The Britishers were responsible for introducing the egg (and the chicken) to the Bengali cuisine. I still remember when we lived in a joint family with my great grandmother still guarding the ethics of the kitchen, how egg or chicken were never cooked. While mutton was a popular meat, especially on Sunday afternoons and on special occasions, chicken and egg were quite unheard of. shallow fry the spice coated potatoes and eggs until they are golden brown. If it is cooked during lunch time, the light, orange hued sauce (well almost a soup) is eaten with rice. If this chances on a dinner table, there will be hot Phulkas/ fresh flat breads to dunk them in the sauce. Every home has a different version. As far as memories go, I took the responsibility to cook this dish back at home. I am not sure when I started on it or how. This is the way my dad loves it and I have always cooked Dimer Jhol with lots of ginger whenever he is here during the summer months. Some homes do use onion and garlic and spices for a Jhol, and just have the sauce of a runny consistency. In our home, we would call that a Dalna but with a slighter thicker sauce. Dimer Jhol for me always will be redolent of ginger and fresh coriander and no other spice. Summer break is almost here and we cannot wait for it to start! Looking forward to spending time with the girls and cooking for us. Note: Fresh green peas maybe added to this recipe. Add them when you will add the eggs almost towards the end of the cooking process. The eggs should be hard boiled and peeled. After peeling them, make two small slits on the top or bottom of each egg or on the sides. This will enable some of the flavors of the sauce to seep inside the eggs. Sprinkle some salt, little red chilli powder if you want and turmeric powder (about 1/4 teaspoon) on the eggs and rub them in. Set aside. Peel and quarter or half the potatoes. I usually use 2 small potato halves for every egg, but you can use more or less. 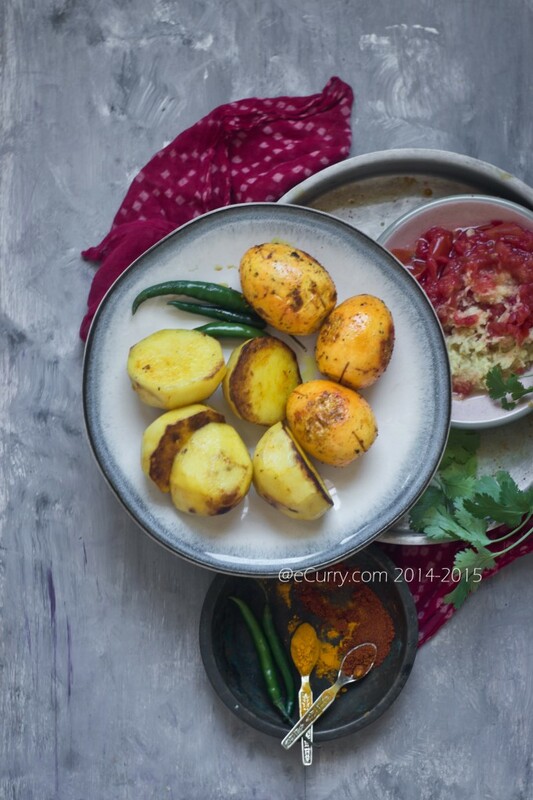 Sprinkle some salt and about 1/4 teaspoon turmeric on the potatoes and rub them in so they are coated. Set aside. Process the ginger; either finely grate it or pound it to a paste or use a blender to make a paste. Grate the tomatoes using a box grater. The tomato can be pureed too, but I like the slightly coarse texture of the tomato when grated. Combine the ginger and tomato in a bowl and set aside. Combine the rest of the red chili powder, turmeric powder and salt with about 1/4 cup water and set aside. Heat a teaspoon oil in a kadai/wok or pan. 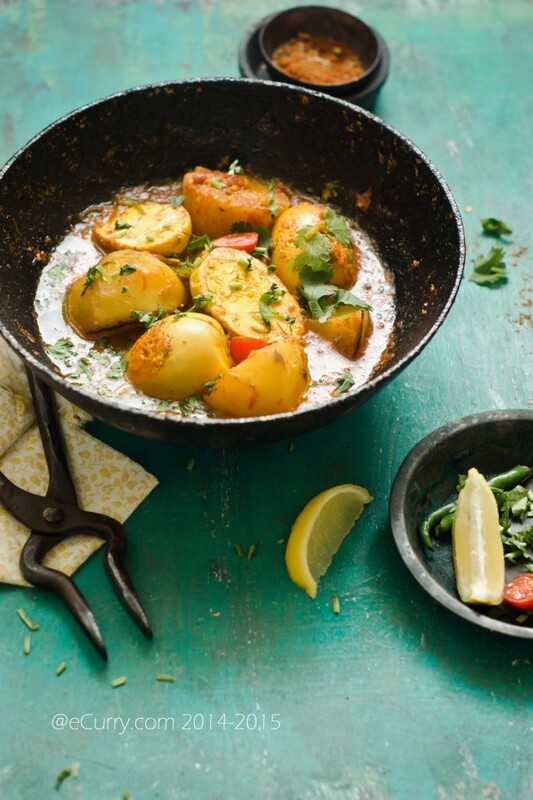 Carefully place the potatoes in the hot and cook at medium to high heat until the sides start to brown. Remove with a slotted spoon and set aside. Heat another teaspoon oil and now place the eggs in the oil. Cook them while turning them around gently onc e in a while so all the sides turn golden brown. The cooked sides will seem as if the surface has crisped a little and that is how it is supposed to be. On the other hand if you want the eggs to be be left plain boiled and not cooked, you may just let them be and skip this step. Heat the rest of the oil. Add the slit green chili peppers if you are using. Be careful for they will pop in the oil. When the sides of the peppers brown, add the tomato ginger mix and cook in medium to high heat for 2-3 minutes. A lot of the liquid will have evaporated. Watch it closely and do not let it dry up. The time is approximate. Now add the mix of turmeric salt and chili powder with water. Give it a good stir and cook until most of the liquid has evaporated. The mix would have thickened and oil will start to separate from the sides of the pan. Add the potatoes and toss well for the mix to coat the potatoes and cook for about 5 minutes in medium to low heat. Now add about 2.5 – 3 cups of warm water to the pan/wok and once it comes to a boil, partially cover and cook until the potatoes are very much near done. Add the eggs and cook for another two minutes and remove from heat. Adjust salt and garnish with fresh cilantro. Serve with hot steamed rice. May 29th, 2014 | Category: Curries, Sides & etc. Beautiful pictures Soma. Darun hoyeche! I love the photographs, you have such an artistic style of presenting. Am bookmarking this, as it is such a unique recipe. Faboulous! 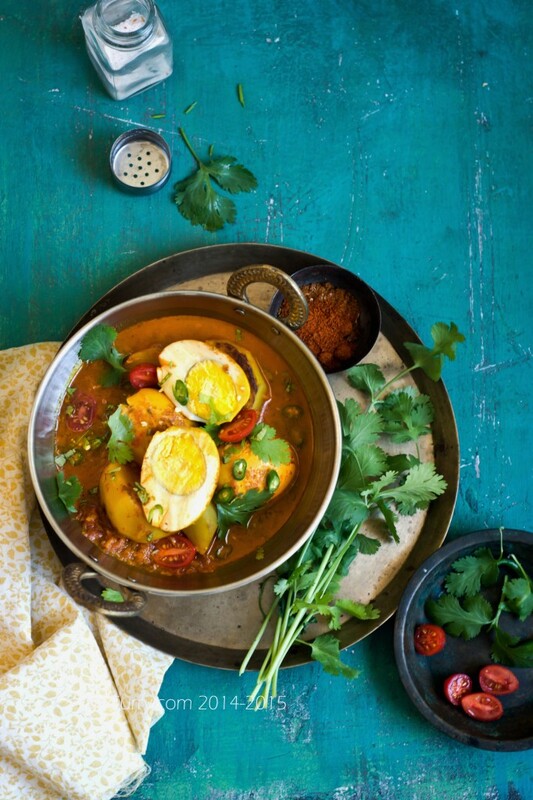 I love egg curries and this one looks magnificent. Soma, i am one of those readers of yours, who opens your page when i am in need of something simple and yet should be a hit 🙂 its been a while i logged in on Blogger, and today seems to be the perfect time to let you know, how loyally i follow your blog. Its absolutely brilliant ..be it dimer jhol or payesh your stories, your recipes are fantastic !! Ah for all the days that there wasn’t any other Non-veg option, we would be having Deem. The pictures are as usual amazing. I have a few pictures lying in my album… have not been getting the time to write. Maybe I could write the story and link up to yours. No onion, no garlic? the two most basic ingredients. Did anyone try it? No Onion or garlic. Basic Ingredients? A whole lot of Bengali recipes are cooked without these two “Basic ingredients”, including delicacies like Dhokar Dalna. The flavor comes from a lot of ginger and green chilli and the texture from tomato. This is a tried recipe and we have been cooking this for many years. Why don’t give it a try? 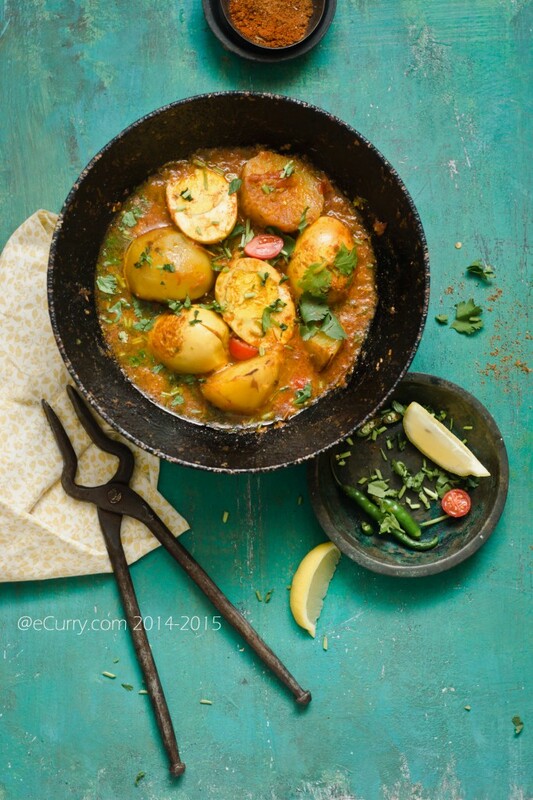 The egg curry with onion garlic is cooked like meat in our home… not light. So nice♡ First ever I get a egg curry recipe without onion & garlic. So thanks a ton.